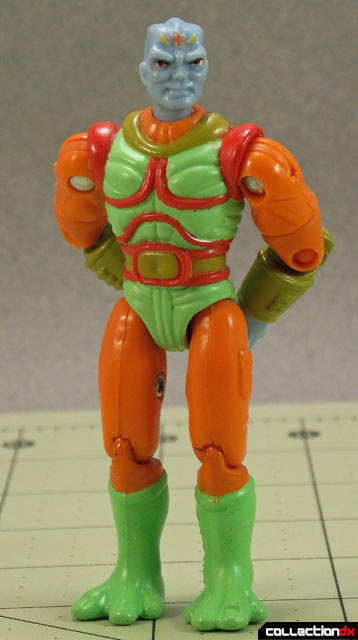 Exosquad is one of the truly amazing franchises of the early 90s. The cartoon ran for two seasons and did not shy away from characters dying, showing the true horrors of war, or using the Neosapien/Terran war as a metaphor for racism, class warfare, and how conflict changes people. It was amazingly advanced for its time. 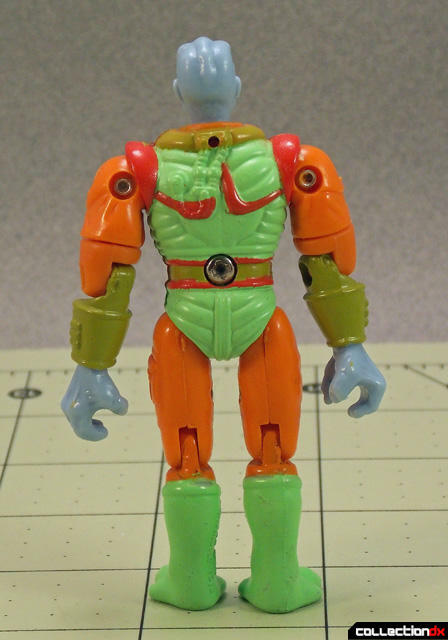 But as good as the show was, the toy line that it produced may have been even better. 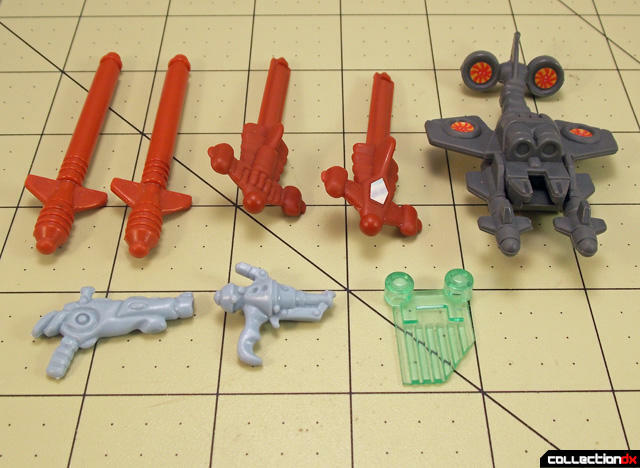 Playmates was able to produce almost all of the major characters and their E-frames, as well as Jumptroops and Micro Playsets, giving kids a myriad of options for recreating their own Neosapien/Terran conflict. 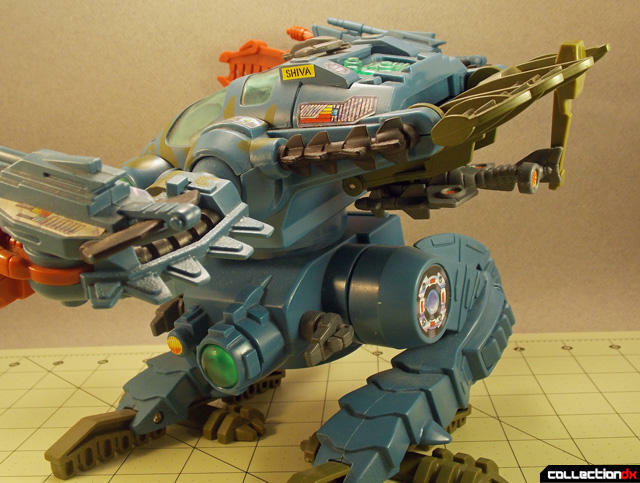 I was fortunate enough to get almost the entire line of E-frames when they first came out, but one that consistently eluded me was the Amphibious Assault Light Attack E-frame with General Shiva, but could it live up to the hype I had built up for it in my mind? 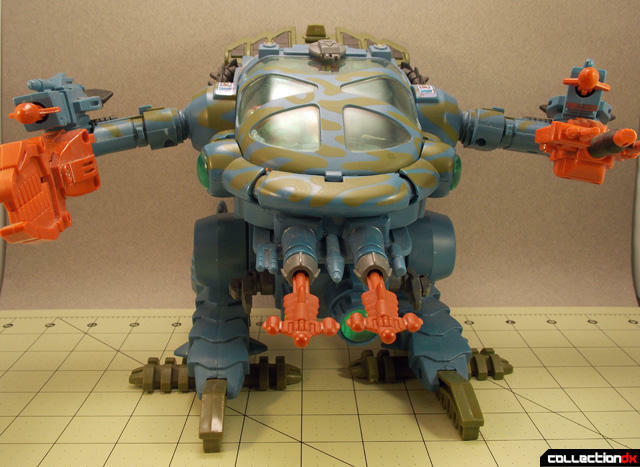 As one of the larger E-frames in the toy line, the Amphibious Assault E-frame is loaded with gimmicks, all of which reflect the war-like nature of this machine. Unfortunately, the gimmicks do detract from the articulation, which is mainly restricted to the arms. 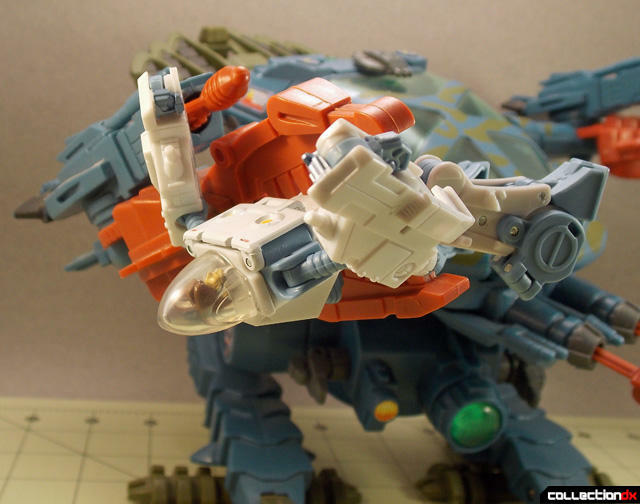 There are two ratchet joints at the “hips” of the figure, which allow you to pose the E-frame in a more menacing downward looking pose as shown above, or slightly more neutral pose with the body leaning slightly back. The waist swivels 90 degrees to each side, and the electronics prevent it from going any further. 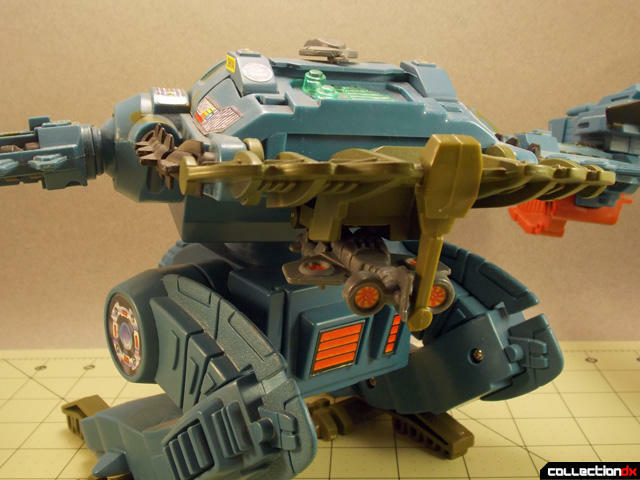 As I mentioned above, the arms feature the majority of the articulation in the E-frame, with a ball joint in the “shoulder” of the frame allowing the arm to raise and lower and rotate to point up and down. 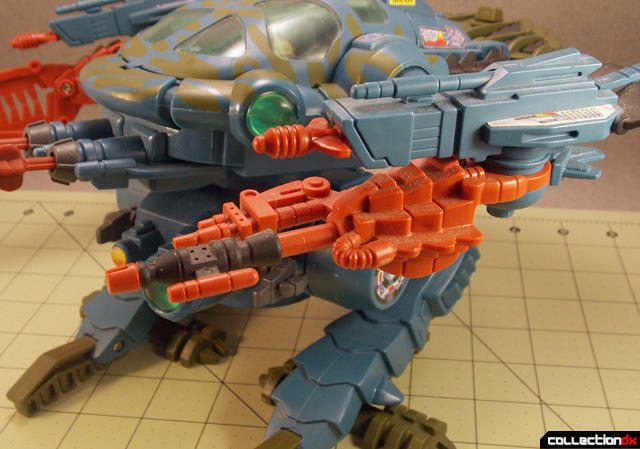 The elbow straightens out so that you can point the weapons on each arm out to the side, and the two missile launchers, strangely, can rotate inward enough to point at the cockpit, but cannot rotate out any further than the tip of the claw and laser. It seems like an odd choice, but you can have the main weapons pointing out while shooting the missiles forward, I guess? The left arm features a telescopic gun and true to the name, the black and red barrel extends and retracts. 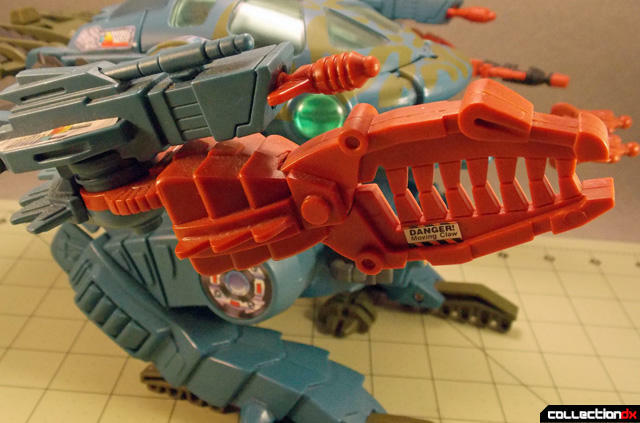 Aside from the missile launcher on top, this is the only gimmick on this arm. 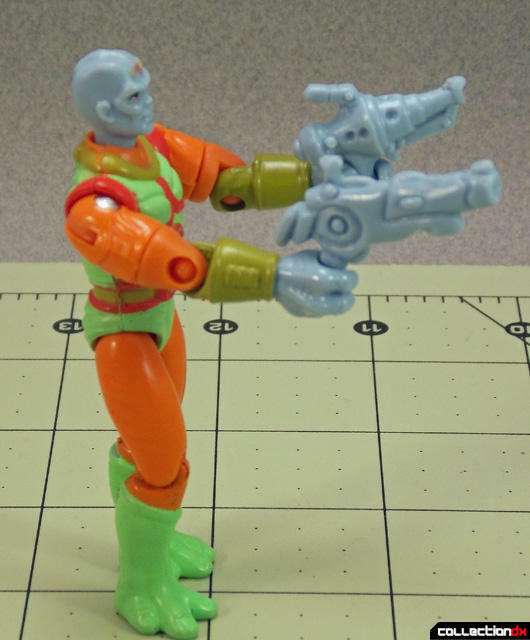 The right arm features a grabbing claw, which is always fun on a figure, especially when it can hold on to something! Using a lever located on the back of the claw, you can open and close the claw to hold enemy E-frame pilots. Or, since I didn’t have a member of Able Squad handy, Spike Witwicky in an Exo-Suit. Seemed appropriate. The back of the E-frame features the main gimmick of this figure, which is a launch pad for the Ray Drone accessory. The back folds down while the drone sits securely in a small slot. When you are ready to deploy, you fold up the main panel and then fold out the drone. It slips off of the bar and is ready for action. There is also a small radar dish type thing that can fold up. There are two more action features on the very front of the E-frame. First, there are two Hammerhead missiles that load into the front launchers. Theoretically, these are launched by pressing down on the front of the body, which also activates a show accurate missile launching sound, which is very clear and mechanical. In reality, the slight movement of the top half of the E-frame both launches the missiles and sets the sound off. Also, at least on my figure, the sounds activate with the merest hint of a breeze, or just when they feel like it. The first time I heard them, it was awesome to get such a show-accurate sound. The fiftieth time, having been shot, again, by the hair trigger missiles, the batteries came out and you will notice that the missiles are not pushed all the way in for fear of injury. The second feature involves the cockpit. 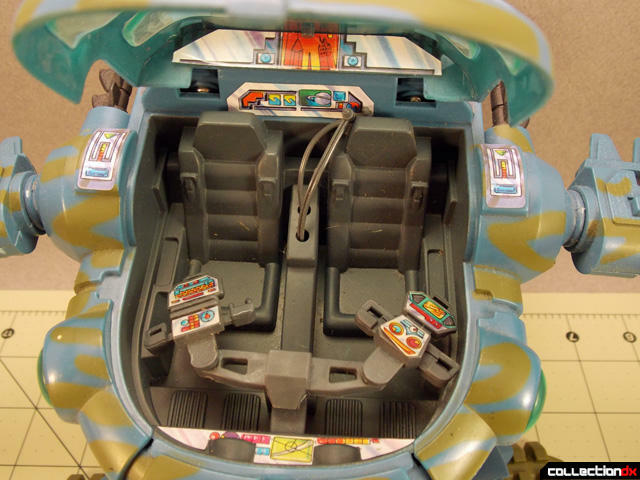 By pressing on or firing a missile at the very front portion of the cockpit, it flies open simulating battle damage. This is also the only way to place figure(s) in the cockpit. Most of the E-frames in this line can only hold one pilot, but the light attack class can hold two. The interior is very detailed with some amazing stickers showing off various control panels. 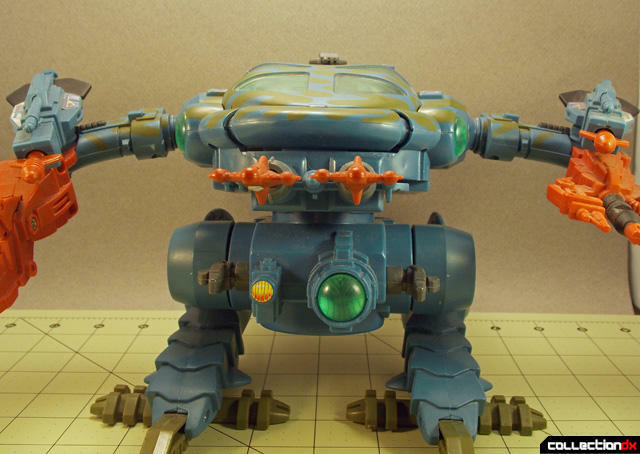 The front panel swivels for ease of figure placement, and there are two “cyber-jacks” that plug into the back of the figure neck for them to pilot the E-frame. Shiva fits comfortably inside the cockpit and looks very natural while doing so. There are four missiles, a clear blue Power Cell, the Ray Drone, and two hand weapons for Shiva. To pilot the Amphibious Attack E-frame, we have General Shiva. 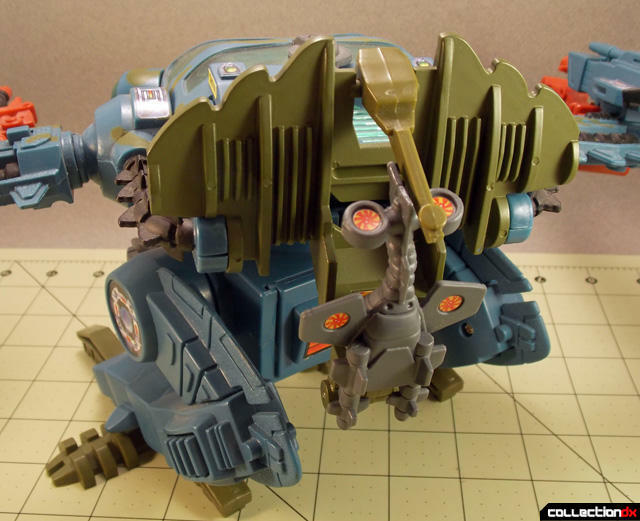 He stands 3” tall and features the same articulation as all figures in the line; swivel neck, bends at elbows and knees, swivel biceps, ball hips, and riveted shoulders that rotate 360 degrees and raise and lower. 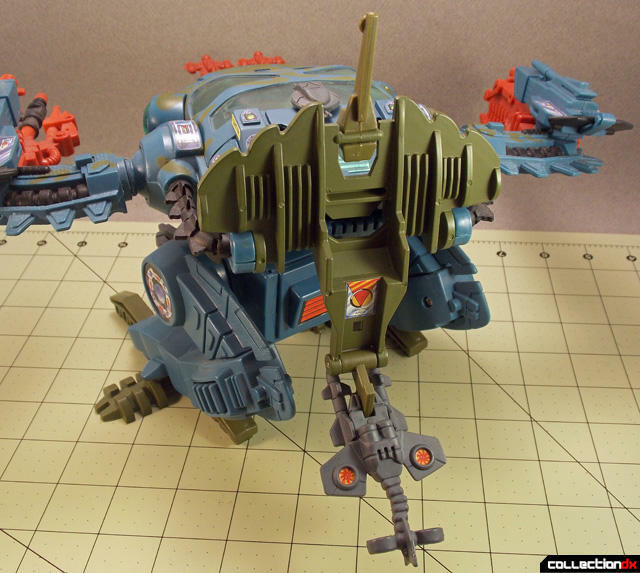 The color scheme is a bit ridiculous when compared to the muted blue/grey pallet of the E-frame, but certainly make him stand out amongst the other Neosapien figures in the line. Shiva comes with two hand weapons, both very detailed and futuristic looking. The sky blue kind of matches the blue of the skin, but is a few shades lighter, and don’t really match any other colors with the set, but they do look a lot better being held than some of the other weapons in the line. So, did the Amphibious Attack Light E-frame live up to the hype I had built up for it? Happily, I can say that it did. 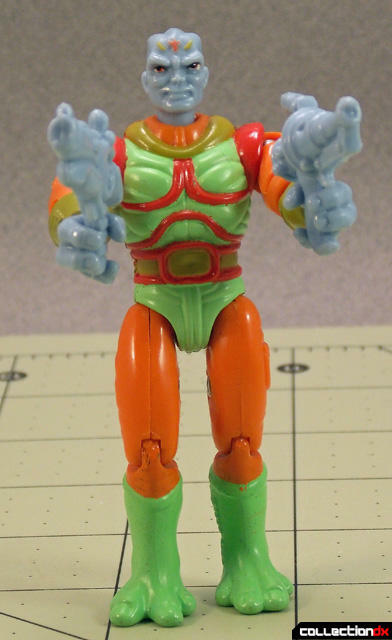 Despite the hair trigger waist and some looseness in the arm poseability, and the frankly horrendous color scheme on Shiva, in the end it is a perfect example of what can be done with a figure/vehicle toyline, combining a serious attempt at show-accuracy with an assortment of gimmicks to create a truly fun toy. It’s obviously a must have for any Exosquad fan, as is the entire line, but you don’t need to have even heard of Exosquad to enjoy this toy. You just have to like well-made toys that are meant to be played with. These are getting harder to find in complete condition, so if you are on the fence, buy it when you see it. Aw yeah, my friend had this, back in the day! 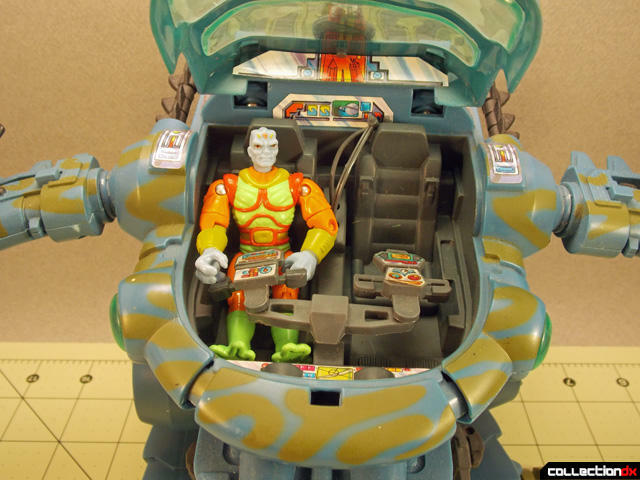 Friggin' awesome toy - hell, most of this toyline was awesome! I only had one of the smaller ones, but I used it for everything. It's too bad we can't get something like this again. I remember seeing this in stores, but thought it looked a little to much like ED209. I did have the one that could transform into the motorcycle, that one was awesome!. I also had the Robotech/EXO Squad stuff.